Ison Rock Ridge was one of the "most endangered mountains" in America, that is, until the Virginia Department of Mines, Minerals and Energy denied a permit that would have obliterated nearly 1,300 acres of mountainous terrain. Appalachian residents in Virginia are breathing a sigh of relief with the news yesterday that the state Department of Mines, Minerals and Energy has denied a permit for a massive strip mine on Ison Rock Ridge in Wise County. Although the coal company, A&G Coal Corp., has appealed the decision (no surprise there), local citizens and opponents of mountaintop removal stand ready to continue defending Ison Rock Ridge, and the citizens of Wise County. “Preserving our clean mountain water, protecting our productive forests and making this a place businesses want to move to is a key part of building an economy built to last the next 100 years. Stopping the destruction of Ison Rock Ridge is an important first step,” said Sam Broach, president of Southern Appalachian Mountain Stewards (SAMS), a Wise County-based group of local citizens, including former miners. 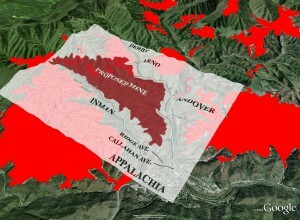 A&G had proposed a 1,200-acre mountaintop removal coal mine on the ridgetop, behind the town of Appalachia. The mine would have buried about 14,000 feet of streams with more than 11 million cubic yards of rock and dirt in nine separate valley fills, posing tremendous harm to the citizens and the environment. Appalachian Voices and Wise Energy for Virginia Coalition members and activists also made their voices heard in major way, helping put public pressure on key decision-makers to preserve Ison Rock Ridge, one of the last un-mined ridges in Wise County. We worked with partners to engage tens of thousands of citizens in Virginia and beyond to oppose destruction of Ison Rock Ridge and worked with partners to organize a “Virginia Rising” rally outside the Environmental Protection Agency headquarters in Washington, D.C., including citizens from all across the commonwealth, standing in solidarity with the local residents who would be directly impacted by the proposed mine. Dominion Virginia continues business-as-usual. As the largest electric utility in the state, Dominion burns mountaintop coal at ten of its plants, amounting to about 96 million tons in the last decade. With our partners in the Wise Energy for Virginia Coalition, Appalachian Voices presented several resolutions to Dominion’s shareholders last Friday, including one that would outline the impact of ending Dominion’s use of mountaintop removal coal. Alas, it failed. As did the other resolutions WEFV presented – although the resolution calling for Dominion to report on the financial risks of climate change garnered an impressive 22% of the vote, a sign of the growing concern around sea level rise and wacky weather patterns. (Check out this link for some eye-catching ways that WEFV got its message across to shareholders as they entered the meeting at the Virginia Museum of Fine Arts. The Wise Energy for Virginia Coalition will continue to work with Dominion to advance more energy efficiency programs and renewable energy projects – but we’ll also continue to expose how the utility too often puts the wealth of shareholders above the health of the rest of us.